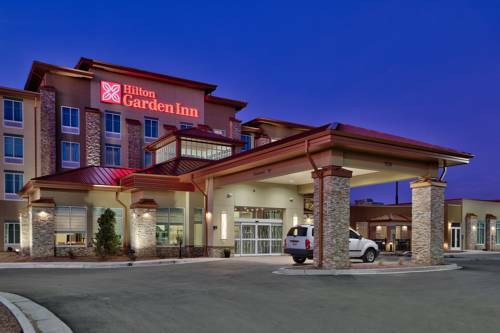 Situated just off of I-40 Hilton Garden Inn Gallup is just a short distance from lots of hiking paths shops and restaurants. Gallup Municipal Airport is just 10 minutes* away by car and complimentary onsite parking is available for your convenience. Corporate guests will appreciate our close proximity to many local businesses. Visit attractions including the Gallup Cultural Center Fox Run Golf Course the Navajo Nation Museum and the Wild Spirit Wolf Sanctuary. all easily accessible from our welcoming hotel in Gallup New Mexico. Settle into an inviting guest room featuring complimentary WiFi an HDTV a microwave and a refrigerator. Relax on the plush bed complete with hypoallergenic pillows and work comfortably at the ergonomic desk. Upgrade to one of our suites for more space and a hot tub. Stay connected in the complimentary 24-hour business center. Plan a conference or training event at this Gallup NM hotel with over 3 000 sq. ft. event space including a modern boardroom. Our friendly professional staff catering services and contemporary A/V technology will ensure that your function is a success. /Work out with the latest equipment in the complimentary fitness center or swim in the heated indoor pool. After a busy day relax on the sunny outdoor patio. Stock up on snacks and sundries in the 24-hour Pavilion Pantry. Unwind with a beer or a glass of wine and enjoy tasty American cuisine in the relaxed Garden Grille - Bar or dine in the comfort of your guest room with evening room service. - Pittsburg Midway Coal Co.